Neill Blomkamp’s Oats Studios has released yet another short film online from Volume 1 of his experimental movie-making venture. It’s a whimsical tale called God: Serengeti, which shows an unorthodox view of the supreme being at the dawn of mankind, and he’ll look very familiar to fans of Blomkamp’s work. 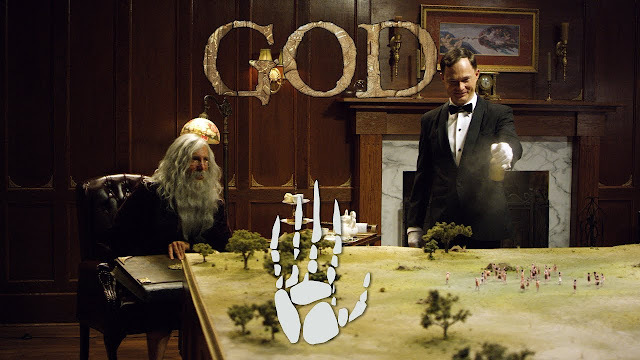 Available to watch via the Oats Studios Channel on YouTube (or Steam), the new offering depicts God himself lounging in a comfortable drawing room, flanked by a butler named Jeffrey. God looks a lot like Sharlto Copley (District 9) in a massive beard and speaks with an upper-class British accent. He’s reading a manual of some kind (“Bit technical … but there’s a good recipe for Black Holes“), as packs of elephants and groups of Neanderthals wander around on the table in front of him.